Over the past few months I have received numerous emails from collectors and neophytes asking me to comment on the prices asked for various Omega Constellation Grand Luxe models offered by on-line sellers, the occasional bricks and mortar retailer and, of course, the usual range of electronic auction marketeers on the web. 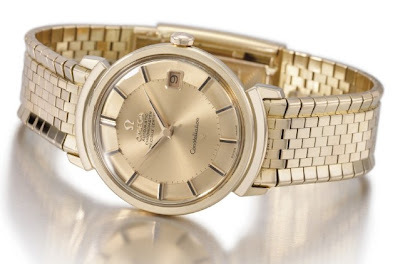 In this short post, I am going to offer some comments on the values of Omega Constellation Grand Luxes, and make the occasional snide remark at the audacity of some merchants in asking thoroughly indefensible prices for the over-hyped pieces they're trying to offload. Frankly, I have never seen such overt examples of avarice than that displayed by sellers who acquire GLs into stock: visual representations of dollar signs seemingly hijack their rational minds when confronted with even the least impressive example of a Grand Luxe. It’s almost like their brains have been invaded by nano-robots programmed to trigger millions of synoptic explosions that evoke the robber baron mentality. The first counsel I would like to offer is PLEASE IGNORE THE 2007 OMEGAMANIA AUCTION and treat it as you would the pre-crash US housing phantasm, the Dutch Tulip Scandal, the South Sea Bubble, or pre-1987 stock prices. 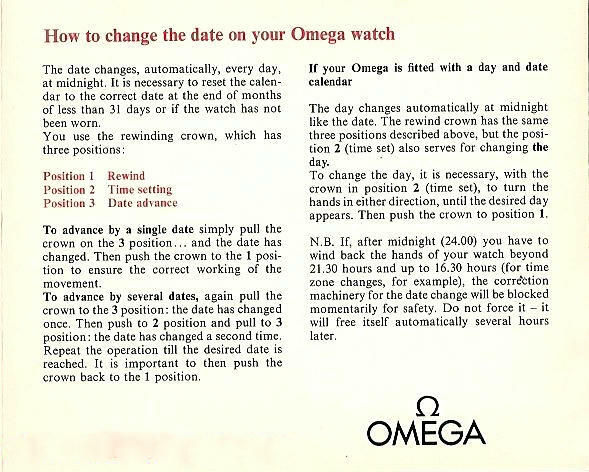 This was a mega-hyped ‘event’ designed to serve the purposes of both Omega and the auctioneer, and bears no relationship to the general reality of the vintage watch market. Forget the prices realised: they were artificial and simply reflected contrived mass hysteria. Reduce the valuations of various models as gold prices recede (if they do) from historically high prices. I have seen dealerships and eBay sellers asking up to 30,000 USD for Grand Luxe models. I recommend that you view such instances charitably, but incredulously. Perhaps such outrageous demands on your pocketbook and belief in humanity are simply disguised appeals to subsidise their children’s orthodontic work, a unique way in which to solicit contributions to fatten their early retirement funds, a means to pick up the tab for their spouse's rehab, or to feed their cravings for excessive profit? Because, assuredly, the prices asked do not reflect market forces. In the real world of 2011, use the yardstick of 5500 to 7000 USD as a fair price for an Omega Grand Luxe. and discount for wear, stretch and condition. I understand the points you're making about price inflation by some merchants, but bear in mind that the cost of a merchant acquiring these pieces to begin with is actually quite high; Omega themselves make a pretty penny off of their wholesaling. In any case, as always, never be afraid to browse around for the best price on a big-ticket item. Quite agree that acquisition costs can be high, and certainly the gold price influences the upward movement of these models. But I think there is a difference between a 'nice profit' and hyping up a GL as rare and hawking it around at an extravagant price. Hi, reading your blog with interest. Both of these models are on the uncommon end of their respective collections. So, in many ways, it will be the market that decides value. I'm not talking about the informed seller - UNinformed buyer market, but where there is a level playing field. I have seen examples of both with price tags that I consider outrageous and I have observed on-line auctions where outcomes vary significantly for the same pieces, on occasions being surprised at the low value realised. That having been said, I am prepared to speculate the values of both and explain why I arrived at my estimates. Currently C-Shapes with 18k Milanese bracelets sell on the global internet market for around USD 4500. While the prices vary for Buy-It-Now examples, at auction 4.5k s usually around the figure they go for. Gold scrap value is around 3300 for these watches at today's prices. Generally, over time I have noticed that at auction white gold examples fetch a premium of 50% or over. So for an informed bidder to pay up to 6.5 to 6.7K for a white gold C-Shape with Milanese bracelet on a global internet auction, I would think they knew what they were doing. I discount bricks and mortar vintage prices as they reflect a different market structure as does say chrono24 and other sites where one sees higher end Constellations languishing for months and years because of avarice on the part of sellers. The Grand Luxe example is more difficult because there are so many different models. Recently for example a domed dial GL model 368.0802 with brickwork bracelet sold at a European auction house for the equivalent of just under USD4000, where I expected 6k plus! I know of a 14365 with silver box that changed hands after spirited bidding in Hong Kong for a price of 9.4k, so it's hard to compare apples with apples. A pink gold example of a cal 354 powered model is going to demand more than say a pink gold cal 505 model, so let's stay with 368.0802 pie pan in good condition without a refinished dial and with factory specced crown as the point of comparison. Just wanted to comment that a grand luxe with the brick/snake bracelet (without any links taken away) contains $5000 in gold (at $1700 an ounce) as there are 4 ounces of 18k gold there - I weighed a 504 GL with full bracelet at 130 grams and a 504 movement with dial, hands, crystal and crown at 18 grams. I would say the price range for an excellent condition GL with full length brick bracelet would range from $7000-12000 with the lower end for a domed YG example and the higher end for a PG stepped piepan example. WG would be higher still and who knows how much for platinum. These watches are worth more than the deluxe piepans which if in excellent condition now go for $3500-4000 or more fairly regularly. I usually round off at 20 grams on average for the non gold components, but 18 grams sounds right to me. I can't recall what the price of gold was in early 2011 when I posted but I recall that after weighing a 7.5 inch GL it had about 2.6 - 2.7 troy ounces of 24k pure gold when I calculated it out. At around the 1500-odd per TO, my figures for the time I believe were accurate. But, gold value as you point out will rise and fall. I'm reasonably comfortable with your value ambit in today's market, although YG examples seem to be realising somewhat less than the 7k at times. 12k for a PG stepped dial could be realised at auction, although I note that over time not too many sellers who have prices of 20k and more for PG stepped have had the courage to let the market decide.